Many households now own a computer: this will usually have a word processor and a printer, together capable of producing letters and other documents. Most computers can access the Internet and their owners will have email accounts for communication with others. This has resulted in a large part of the business of the traditional small commercial printer (e.g. producing billheads, etc.) being lost. Small printers who love letterpress find it increasingly difficult to resist the ease of digital printing, at least for jobs where a large amount of text was required (for example, Church or Society Magazines). 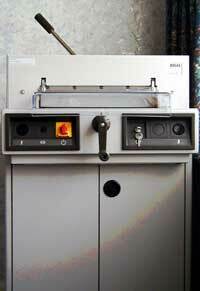 The small printer, will often have a small litho press and perhaps an Adana 8x5. Photocopying will probably remain the preferred method for Newsletters etc, but digital copiers are replacing the traditional analogue machines and thus producing much better impressions (especially for illustrations). 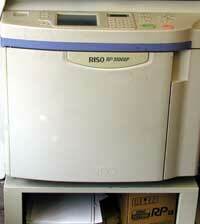 The cost of colour copiers has plummeted recently and they are likely to be used more and more in the future. For small printing from computer, inkjet printers are often used for very short runs, but the cost of ink cartridges and the slow speed suggest that colour printers based upon toners will become increasingly popular. It is hard to predict how colour Risography will develop in the future. As most people with a computer already have a word processing (WP) program you may wonder why another program is necessary. Experiments have been carried out comparing the use of WP on a complex job with the use of a Desktop Publishing (DTP) program. It has been shown that whilst the WP program can produce a reasonable result it takes longer to produce a good result. In addition WP program may be unable to rectify anomalies in typography due to a lack of finer control over point sizes, kerning, leading, etc. It is essential to be able to fully control exactly how each page will be laid out and this is where a DTP program is an advantage. Quark Express. The top of the range DTP program and used by most professionals (but InDesign is catching up). It is very expensive at over £700. InDesign. A fully featured professional program which replaced Pagemaker, the original Apple Mac DTP program. While only about a third of the price of Quark it can give much the same results. It is increasing in popularity. Corel Ventura Publisher. The first full featured DTP for the PC. Excellent program, but no longer widely available. Serif PagePlus. A low cost program with wide range of features. It is especially good for special effects. Price - under £100 (with some special deals). Microsoft Publisher. Another low cost program (available as part of Microsoft's Office Suite) with most features you will need. A good programme once you get used to it. The price is under £100. In all the above Desk Top Publishing programs, it is possible to enter text directly. Most people however type out text in their usual WP program and then import the text into the chosen DTP package for editing to produce the final pages. This is also the method employed when using text produced by other authors, or from emails or scanned text. In some cases text imported contains code which interferes with that in the DTP program and unexpected anomalies are produced (which can be difficult to trace). To prevent this it is usually best practice only to import text in plain text (.txt) or Rich Text Format (.rtf). Microsoft Word documents and emails are often the cause of problems. In the early days of DTP, only a few fonts were included with your WP and DTP programmes and to buy extra fonts was very expensive. Now however fonts are now readily available at reasonable prices and a good selection will be included with MS Windows, and with most DTP packages (except the expensive ones!). The best fonts are produced by the major companies eg. Microsoft, Adobe, Apple, ITC, Agfa Monotype etc; and if possible you should restrict yourself to fonts from recognised sources. There are three main kinds of fonts available for computers. Type 1 (Postscript) are more common on the Apple Mac Computers but so far as the PC is concerned TrueType is currently the most common. The latter is however being superceded by OpenType format which was introduced by Microsoft and Adobe - this is superior to the earlier formats because it contains a much greater number of characters; these fonts can reproduce most of the major foreign characters as well as well as advanced typographical symbols and ligatures etc. OpenType supercedes the so called 'expert' fonts. If you open the 'Fonts' section of the Control Panel on he PC you will see that TrueType fonts are characterised by a TT logo, whereas OpenType have an oblique O logo. Another kind is the 'professional' font (introduced by Adobe), these are the ultimate in fonts and replicate the fine differences found between different type sizes in the best letterpress typefaces. Too many fonts can slow the computer down and it is advisable to remove any fonts which are not required. The way you practice typography is very important if you wish to produce work which looks professional. A Guide to Digital Typography and Style may be accessed by clicking on Typographical Guide . NB. Much of the information given below will be especially relevent to the printing of programmes, reports etc produced for Clubs, Societies and Churches etc. Producing newsletters or magazines can be a lonely business - the editor and designer are on their own, especially in the beginning. It can be very useful to be able to meet other people with similar problems at meetings of the local branch of the BPS. Computers have made home publishing fairly simple, but you still need flair to make your publication interesting and readable. The golden rule to achieve this is to study carefully commercial newspapers and magazines. Become aware; Study them carefully. Expert designers have long since decided on the best way to lay out words and pictures on a page for maximum effect, so learn from their results. The most common fault in layout and graphic design relates to line length, In all too many cases readers are expected to scan the full width of an A4 page set in 11point or similar. The eye just cannot do this with ease and thus the reader may easily miss the message. This is however only one of the many faults which can occur in the design of newsletters and magazines. A Guideline on the graphic design of such publications may be accessed by clicking Guide for Newsletter and Magazine Layout . 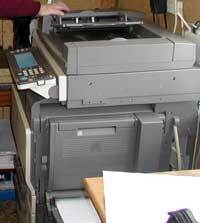 Photocopying has been around for a long time now but in recent years the original analogue copiers have been superceded by Digital Copiers which produce a far better image which is hard to be differentiated from printed examples. Digital Colour Copiers which produce copies of the quality similar to traditional colour printing have now also been reduced to an affordable price. Small circulation material can be produced on computer digital printers in monochrome or colour. Medium quality printing is possible on the Risograph or similar machines. 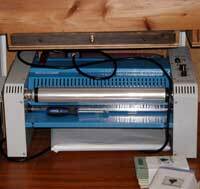 These look a bit like a photocopier, but they produced cheap paper masters from which you could run off hundreds of copies very quickly. 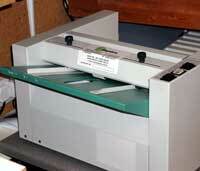 Later models of these machines can give higher quality print in a number of colours. This kind of printing is good when cheapness is really important (e.g. for magazines or newsletters from Churches or Societies). Newsletters and small circulation Magazines can be produced in-house, using the methods described above. If however commercial printers are to be used, the design and typesetting can be done in house using your DTP programme, with the output converted to good quality pdf (prtable document format) files which can can be used by most commercial printers. The Publishing Group of BPS has members who produce short printing runs of high quality using computers and digital printers which, when printed on suitable stock of paper and board can look quite impressive. An article, on some practical points on Digital Printing, by Derek Fordred which will be helpful to beginners can be read after clicking Digital Printing .